Tips and tricks for the Team Bride to win the Juuta Churai ceremony! No wedding is complete without the famous ‘Juuta Churaai’ ceremony. Initially started off as a ritual, now it has taken the shape of a friendly rivalry game between the bride’s team and the groom’s brigade. And, guess whose side did we choose? Ofcourse, we are gonna favour our bubbly bride and her team! This is one of the safest option for hiding the oh-so-precious pair of shoes cause people don’t bother about the vidaai car up until that moment has arrived. 2. Under the sleepy eyes of cute toddlers! Every wedding ceremony has a room specially reserved for toddlers who when after the long wedding ceremonies get tired and well, start screaming at the top of their voices. So towards the night, the entire room gets filled with sleepy kids. Nobody, in their wildest of thoughts would suspect the shoes to be hidden in the sleeping angels’ room. Sounds like a good idea, doesn’t it? People definitely clutter up near the DJ to play their jam but no one, I assure you no one, is going to suspect the DJ wale Babu to have kept the much wanted shoes hidden underneath! Another foolproof idea to secure the Groom’s shoes is in your team is by finding a spy for your team. What I mean by this is that, there are several guests in the wedding that are simply neutral for both the teams. Getting one such guest to spy from your side would be a golden move to know all the whereabouts of the other team! Although, it sounds quite difficult but just imagine how convenient would that be? I mean that would be like revelation of the surprise by the most beautiful hands (I mean feet :P). So, I hope your idea buckets are brink full with ideas by now. However, there is still a slight chance of defeat falling in your side. Sometimes the groom’s team acts a bit too stubborn about keeping the shoes with themselves. Don’t you guys worry guys, here are some tips and tricks to persuade them otherwise. 1. No negotiations for its a ritual! The first and foremost way is to bring it out in the open, the moment you realise your chances of losing! Telling them out loud, that its a ritual is a sure shot way to take hold of those precious pair of shoes! When the mother of the bride asks the groom team to hand over the shoes, in her sweet and polite voice, there is no way that they can deny this humble request! 3. Out of the world appraisals of the groom! 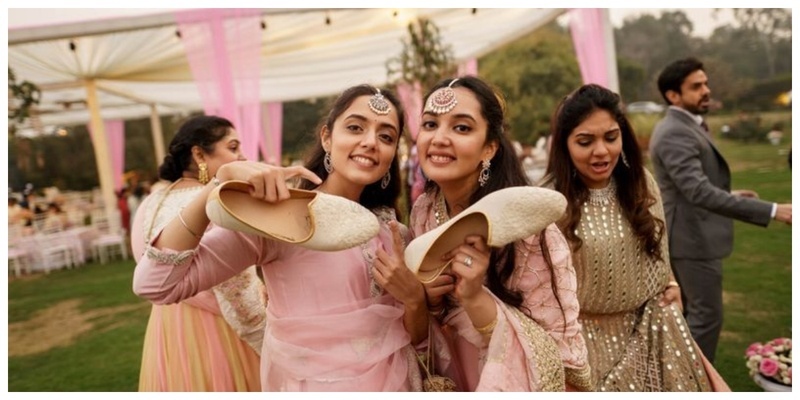 When nothing much seems to be working, one of the best ways to take the grip of shoes in your hand is to praise the groom with sugar coated phrases like- ‘I’m sure Jiju wouldn’t let injustice to happen with their in-laws’ or ‘Jiju is so rich, I envy my sister’. Do you think the newly married guy would want to ruin it in front of his bride? I don’t think so! Settling the whole matter with a one-on-one game can be a perfect solution to it! You just have to think of a way where you have a hint of your chances of winning. Could be anything- ‘Tug of War’ , ‘Antakshari’ , ‘Dumb Charades’ or a ‘dance competition’ whatever leads you to the winning cup! If absolutely nothing seems to be working, then this method is a sure shot way of giving you the victory cup. If you are unable to complete the task by hook, then become a crook! Cry and play on the emotions of the groom’s side by accepting you failed miserably. Be assured, they themselves will hand over the shoes. So, Team Bride buckle up your shoes, cause it’s gonna be a toughie!